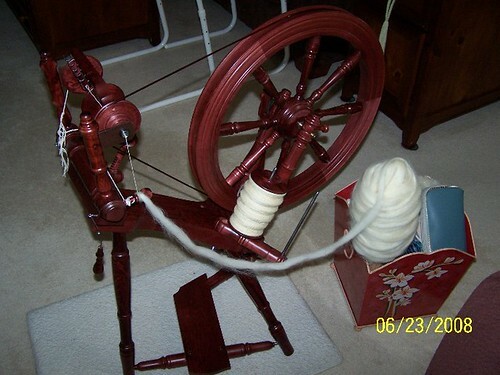 Posted on June 25, 2008	by Linda S.
Have I said before how much I am enjoying spinning…both with spindle and with wheel? I thought perhaps I had… The only slight irritation I’ve had is having to stop, pick up the new piece of roving, find the end and finally add it on. Now in reality this doesn’t take but a few seconds… I guess it’s just the interruption that bugs me. 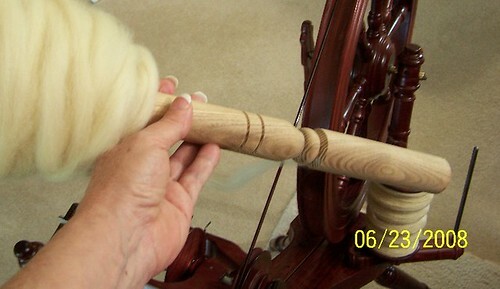 So I decided that I would find a way to make a distaff for my spinning wheel. I bought this generic table leg some time back on a random trip to Lowe’s with my DH. It has set in my work room for about 3 weeks while I have pondered how to do this…. Duh… Just sand it a little so the wool won’t catch and pull, wrap it full of roving, stick it down in my little catch all can and spin away! Now… I will not be leaving it stuck in my catch all can… grin The bottom of the new “distaff” still has the screw on it that is used to screw into the metal thingy that is to be attached to the bottom of the table being made…sooo… I will be adding a metal thingy (I can’t remember what this is called right now…menopause moment and all) .. to a base so it can be screwed in and will be free standing. That make-over will include staining, more sanding and perhaps even some painting. This entry was posted in Crafts, Handcraft, Handwork, Historical Textile, Spindling, Spinning, Tutorials. Bookmark the permalink.